US First Lady Melania Trump has kicked off her first big solo international trip with a wave, a smile and a baby in her arms, aiming to promote child welfare during a five-day tour of Africa. She arrived in the West African nation of Ghana on Tuesday after an overnight flight from Washington and quickly made her way to the Greater Accra Regional Hospital. The first lady saw how babies are weighed – they’re placed in sacks that are then hung from a hook attached to a scale. She also watched a nurse demonstrate how vitamins are administered to babies by mouth and toured the neonatal intensive care unit. Melania Trump also cradled an infant and declared the baby a “beautiful boy” as she handed him back to his mother. Mothers at the hospital for her visit received gifts of teddy bears nestled in white baby blankets, personally handed out by the first lady, according to her spokesperson, Stephanie Grisham. The items carried the logo of “Be Best,” the child well-being initiative Melania Trump launched last May. The first lady did not make a speech but those who met her said afterwards that, unlike her mysterious public image, she was “warm” and “gentle” in the flesh. “She’s very friendly, easy-going and interactive,” said Rabiu Fauziya, a 28-year-old paediatric nurse who helped show Trump the neonatal room in the hospital. 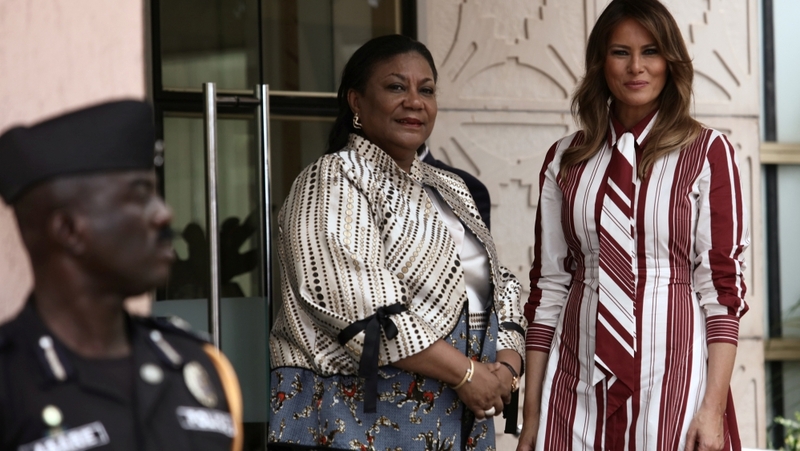 The first lady also had a private tea with her Ghanaian counterpart, Rebecca Akufo-Addo. They exchanged gifts. The women met for the first time at the UN General Assembly last month at which President Trump railed against globalism, earning him stern rebukes from world leaders. The US first lady also plans to visit Malawi, Kenya and Egypt. She has typically stayed out of the spotlight since her husband became president yet she has made headlines for rare public appearances. How To Get Ready For Halloween In The Last Minute? Shouldn’t Elected Officials SERVE Constituents?